The ultimate guide to Europa Sport ski holidays in 2019 & 2020. Don’t let the charming rustic façade of the area deceive you- there’s far more here than meets the eye. There’s fantastic skiing for those of all abilities- from Austria’s largest superpipe to the beginner friendly ‘Family Mountain’- and enough variety in the après scene to keep the largest of groups interested all week. The Europa Sport Region comprises of the resorts of Kaprun and Zell am See, boasting 138 km of slopes split between 3 ski areas: Maiskogel, Schmitten, and Kitzsteinhorn. A free shuttle bus runs regularly between both villages so you’ll have your pick of the slopes wherever you stay. The two villages each have their own distinct character and with the variety of slopes on offer at the different ski areas, the options for your trip are almost endless. Zell am See is the larger of the two, and with the pedestrianized centre full of shops, bars and restaurants there’s always something going on. The slopes on the Schmitten are excellent for intermediate skiers, with the broadest range of terrain in the area and the on mountain dining is wonderfully diverse. The lakeside location is breath-taking year round and donning a pair of skates to take to the ice the middle of the season is a real treat. The village of Kaprun is quieter, though offers quicker access to the more challenging skiing on the Kitzsteinhorn glacier – it’s the better option if you’re after faster access to higher, harder terrain. The superb beginner facilities at Maiskogel are right on your doorstep, so it’s also a great place to stay if you’re skiing with kids. Again, on mountain dining facilities are brilliant- Maiskogel’s family friendly restaurants all offer children’s menus - and the après scene straight from the slopes is lively. Despite the slower pace of Kaprun when compared to its neighbour, there are still plenty of great options if you fancy a drink or two in the evening. Salzburg airport is only 80km away- approximately an hour and a half transfer during the season- and with Munich only an hour further out, the region is readily accessible from throughout Europe. The three ski areas in the region- Maiskogel, Schmitten, and the Kitzsteinhorn- offer a good variety of terrain, though each is more suited to a particular type of skier. Maiskogel, the ‘family mountain’, does exactly what it says on the tin. The lack of drag lifts are a beginner’s dream and the long, gentle blues ease everyone back onto the slopes. There’s even a baby snow park and you can ski straight into Kaprun at the end of the day. There are more on slope restaurants than lifts for fans of regular pit stops; if this isn’t enough, as soon as you step off the slopes you can be on a terrace with a drink at Zur Lederhos’n. 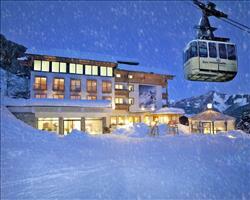 Schmitten, the mountain overlooking Zell am See, is a haven for more confident snow lovers. With slopes ranging from long cruisey blues- we love ‘Panorama’- to thigh burning blacks- ‘Trassabfahrt’ is one of the hardest in Austria- Schmitten is the perfect place to take your trusty snow plough and turn it into something infinitely more magnificent. It’s a terrific choice for skiing as a group as there’s the broadest range of runs and lots of great meeting points- not many resorts can boast two wine bars mid-mountain! The Kitzsteinhorn is the party piece of the region and boasts some truly epic runs and snow parks up on the glacier. With its peak at over 3000m, the glacier is skiable for about ten months a year. Five freeriding routes criss cross the mountain and give access to some terrain that would be considered off limits in other resorts- the lack of grooming and changeable conditions present a different challenge every day! With the Kitzsteinhorn also home to Austria’s largest superpipe and two separate snow parks (the central park often hosts pro competitions) freestylers will be in paradise. As clichéd as it sounds, there literally is something for everyone - regardless of where you’re staying or how you like to kick back off the slopes. For a unique experience, there are few better ways to spend an afternoon than at Kitzsteinhorn’s ice camp. A small hamlet of igloos at 2500m, there’s an art igloo, ice lounge and a great sundeck, not to forget the piece de la resistance - a glowing bar carved from ice where you can enjoy some exclusive ‘Pure Glacier’ vodka! Fans of classic European après will love the slope side restaurants and the bars right at the bottom of the runs in both villages. For a strong sense of tradition, the Breiteck Alm in Zell and Kaprun’s Dorfstadl both specialise in local delicacies - a firm favourite being the delicious Kasnocken (melted cheese dumplings)- all washed down by the ever present glühwein and jagertee. That said, there are plenty of watering holes with a more modern vibe. The Ginhouse in Zell has more varieties of gin than you’d ever have thought possible and in Kaprun the Kitz900m specialise in tower drinking- an economical and inventive way of ordering rounds, the beers are served in a giant tower that you tap yourself! Ice skating on the frozen lake Zell is a favourite for tourists and locals alike, though nearer the end of the season you may have to be satisfied with the indoor option. The Tauern Spa has all of the saunas and spas you’d expect, as well as a great range or treatments. The new “Kidstein” Children’s SPA, allows parents to relax and be pampered whilst little ones enjoy their own pool compete with slinky slide and ‘Wolfs grotto’. When is the best time to ski Europa Sport? With glacial slopes at over 3000m, it’s hard to find a bad time to ski the Kitzsteinhorn. The stunning panoramas from the summit are equally breath-taking at either end of the season and the snow quality (and quantity) rarely disappoints. Likewise, the Schmitten is now 100% covered by snow making facilities and with the recent improvements to the artificial snow coverage on Maiskogel, you’ll usually find good snow on the lower areas of the resort as well. Ski the summits in the morning, and then spend the afternoon lounging by the lake later on in the season - it’s never too early to start your après. The rustic, chocolate box charm of Kaprun lends itself to holidays over the festive period when the village twinkles around the clock and the advent market at Zell always draws visitors from far and wide – these are our favourite times to visit but if you prefer a more peaceful week of skiing, off-peak times like January and March are usually quieter (and often cheaper too). 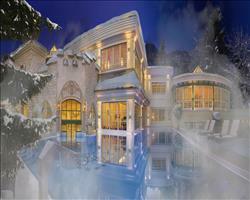 The Europa Sport Region at Christmas comes alive with festive magic each and every year. Stock up on festive treats at the advent market before wandering the fairy-tale streets of Kaprun. Spend New Year’s Eve in the Europa Sport Region and watch in amazement as the streets of Zell come alive. 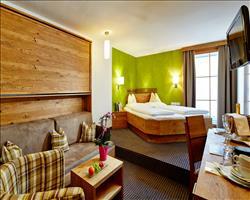 Party the night away with the locals, or have a more sedate evening with the family in the picturesque Kaprun. At Half term in the Europa Sport Region, the resorts are a haven for families. With separate areas for beginners and children, great tuition for all ages, and smaller crowds than some of the larger French resorts, everyone’s assured of a great time. The Kitzsteinhorn glacier sits at 3000m and there’s 100% artificial snow cover on the Schmitten, which means that snow’s rarely a problem in the Europa Sport Region at Easter. However old the kids are, we’re sure the whole family are going to have a great time on holiday in the Europa Sport region. There’s plenty to keep you all entertained on the pistes, as well as some great off slope activities if anyone has enough energy left afterwards! The local ski schools are brilliant- the Frost ski school have a great range of lessons, and OFFPISTE offer advanced lessons and guiding all around the local area. Families of similar abilities can learn together in private group lessons or split up for the morning and ski together in the afternoon. The ‘Rock and Ski’ course in Kaprun and ‘Power Teens’ in Zell offer a range of lessons in more progressive forms of skiing- freestyle, freeriding - for youngsters who are looking to improve their technique and emulate their professional heroes. The smallest members of the family are well looked after too. With BOBO the penguin in Kaprun, and Schmidolin the dragon in Zell, their imaginations can run wild whilst they have the time of their lives on the snow. Kindergartens are available in both resorts for children too young to stand up on skis and childcare can be arranged by many of the region’s hotels. There are plenty of on mountain restaurants throughout the resorts- you’re never far from a rest or a snack - which is great for skiing with youngsters. The Sonnkogel on Maiskogel has a great kids menu and even has a climbing wall to keep the little terrors occupied when they’ve finished lunch. 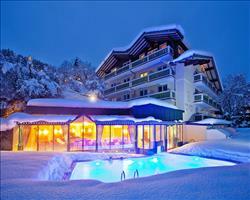 When you’ve finished the days skiing, why not treat the entire family at the Tauern Spa? Conveniently located between the Zell and Kaprun, the kids will have a whale of a time. They’ll love the slinky slide and the water slide, and the two specialist kid’s pools are suitable for all ages. Parents too, will be able to fully unwind- the saunas and spa baths will leave you relaxed and there are a range of massages available if you’re in need of further pampering. We’re positive that each and every member of the group will end up happy if you spend the week in the Europa Sport Region. One of the main selling points is the great range of skiing- whether you’re still working on your pizza and French fries, or spending all day in the park, there’ll be something for you. The Schmitten above Zell is the perfect place for the first few days of the trip. There are some great beginner runs- Panorama is a long cruiser that everyone can manage at their own pace- running alongside one of the trickiest black runs in Austria- the Trassabfahrt. The quality and quantity of the on slope restaurants allow for regular breaks, and the there’s gondola access all over the mountain making downloading easy if anyone’s tired or loses their confidence. 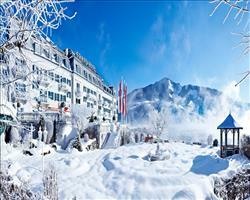 Later on in the week the group can travel over to the mighty Kitzsteinhorn. Anyone not yet up to the challenge can still head up the gondolas to appreciate the view- the Summit Restaurant is surely in with a shout of having one of the best views in the world! The freeriding routes are the closest you can get to backcountry conditions within the safety of a resort and the park and superpipe set up is good enough for the pros. When you get to the village, there are plenty of places to go for a drink to recap the day’s events. In Zell the first port of call off the lifts is The Cabrio (you can also watch any SkiMovie footage from earlier) and in Kaprun you can literally fall off the slopes into the Kitz 900m for your first drink. If it’s a quiet one you’re after, there are some great cosy bars in Kaprun- the locals in the Baumbar will treat you like long lost friends, though if you’re keen on having a bit of a crazy one then Shakers in Zell will hit the spot, with its great happy hour deals. Large enough groups will have a great time if they can book sole occupancy of a chalet, though smaller groups will have a ball with the new friends they’ll meet. The larger hotels in the region have rooms aplenty- it’s no issue if anyone fancies jumping on the trip right at the last minute.